In the first of an exciting new River Cottage Handbook series, mycologist John Wright explains the ins and outs of collecting, including relevant UK laws, conservation notes, practical tips and identification techniques. He takes us through the 72 species we are most likely to come across during forays in Britain's forests and clearings: old friends the Chanterelle and Cep, as well as a whole colourful host of more unfamiliar names - edible species including the Velvet Shank, the Horn of Plenty, the Amethyst Deceiver, the Giant Puffball and the Chicken in the Woods, and poisonous types such as the Sickener, the Death Cap and the Destroying Angel. 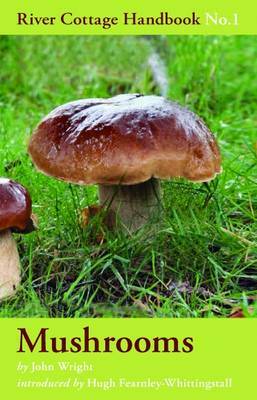 The handbook is completed by more than 30 simple and delicious mushroom recipes from the River Cottage team. With colour photographs throughout, line drawings, a user-friendly Key and an introduction by Hugh Fearnley-Whittingstall, The River Cottage Mushroom Handbook is a comprehensive and collectable guide, destined to be an indispensable household reference.